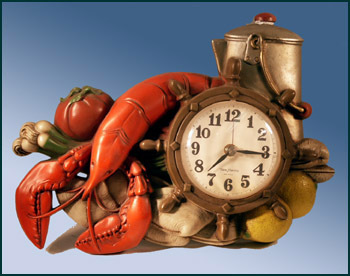 Maritime cultures have always been obsessed with time. Record sailing passages between distant and not-so-distant points were boasted of, not in knots, but in duration of days, and were much-heralded exploits. Journeys over water would often involve stitching a pathway through multiple complex steamer time-tables. A shipwright's pride of work was continually dogged by the twin hounds of 'How much?' and 'How soon?' 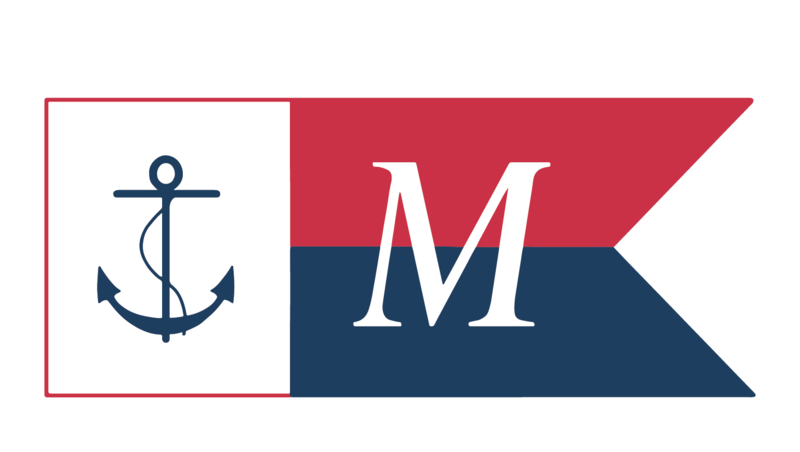 And at sea, time was measured in a way entirely alien to landlubbers: the watch-on, watch-off duty cycle of eight bells, rung incrementally on the half hour, six four-hour cycles in 24 hours. 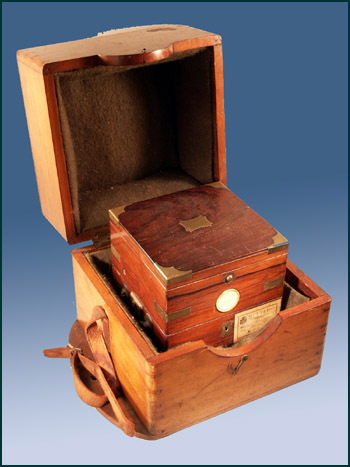 To the 2nd Officer, who was traditionally entrusted with their care, the ship's chronometers demanded even more attention than other fussy shipmates, with equal parts of tender cajoling and strict routine. 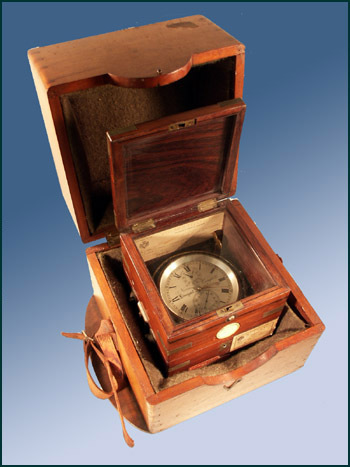 Among the many chronometer rituals: always wind them at the same hour; shut the cabin door when opening their cases to avoid drafts; wind them on their backs to redistribute their oil, but swing them back upright smoothly; place them on pillows in port to avoid the shocks of cargo stowage, etc. 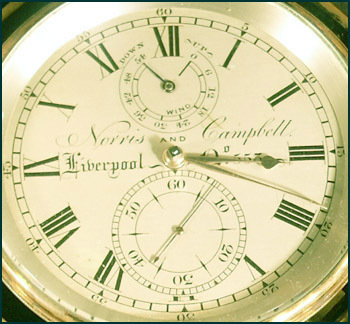 This Norris & Campbell two-day chronometer sits well cossetted in its green felt and horsehair upholstered outer case; the inner case has an upper glass observation lid, while the actual works swing below on gimbals. In the well-traveled ways of a seagoing appliance, this Liverpool-made instrument appears to have been purchased in Genoa, and has rating stickers from Mobile, Norfolk, and Boston. 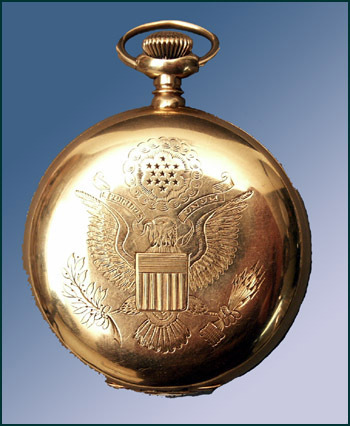 Although these instruments could be checked ashore and rated in ports around the world, or adjusted at anchor to a noon time signal of a dipping flag or cannonshot, it was assumed that their rate would fluctuate, primarily from change of temperature. The trick was to determine the change of rate and apply this daily loss or gain to the calculations of longitude. Even a second's gain or loss each day would accumulate to a dangerous error of position over a voyage. This particular chronometer's rating papers indicate that in 1920 it was gaining 5.9 seconds a day; by 1925 it had settled down to losing 1 second a day. 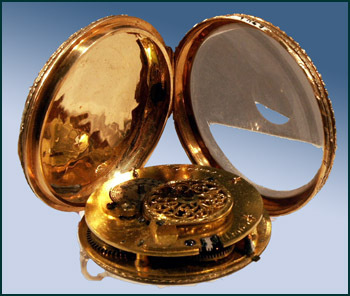 The upper dial indicates how many turns of the key will be needed to always rewind to the same point, which helped to maintain its regularity. 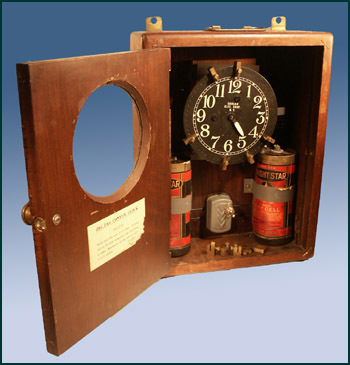 To confuse U-boats, convoy clocks were used in both World Wars to coordinate the simultaneous zig-zag maneuvering of large groups of vessels, often out of sight, signal or radio contact with each other. Ours is from WWII. 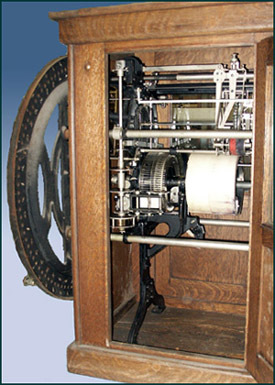 The clock was wound by hand every six to eight days; the batteries powered a signal bell or buzzer that was mounted elsewhere. The single hand swept by the moveable indicators mounted around the rim, arranged to the convoy's pre-determined turn intervals, thereby connecting the circuit to the signal to let the bridge know when to alter course onto the new leg of the zig-zag. The status of the owner of this ca. 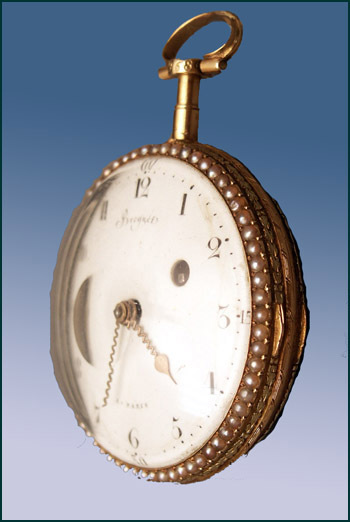 1800 'Breguet' watch is evident in its finely detailed gold relief work and the numerous seed pearls with which it is trimmed. The winding key has an amber stone set into one end. 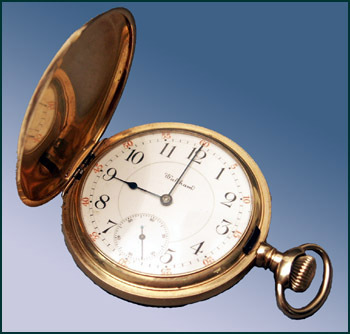 It is the watch of a man of substance: a judge, a state senator, a U.S. Representative, a Bowdoin College trustee, a shipbuilder, ship owner, and correspondent of Thomas Jefferson: Mark Langdon Hill (1772-1842) of now Phippsburg, then West Georgetown. It is also a fake. Abraham-Louis Breguet was renowned in Paris for his innovations in horology, building timepieces for Marie Antoinette, and Napolean. 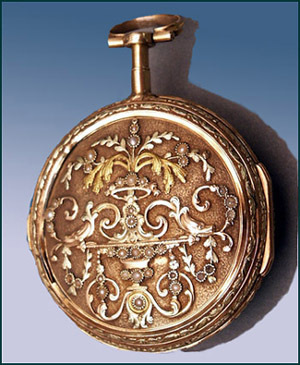 In fact, the Breguet name was so successful that his work was extensively counterfeited; research indicates we probably have an elegant French 18th-century knock-off. 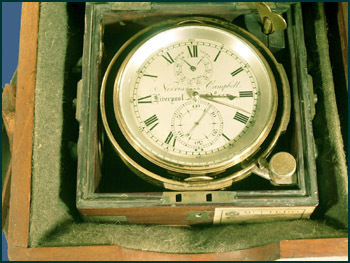 Hill knew his ships, but maybe not his timepieces; or perhaps it was just a good Yankee deal. 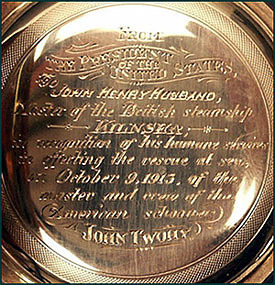 "From the President of the United States, to John Henry Husband, Master of the British Steamship Kilnsea, in recognition of his humane services in effecting the rescue at sea on October 9, 1913, master and crew of the American schooner John Twohy"
Disaster at sea always beats out survival stories. 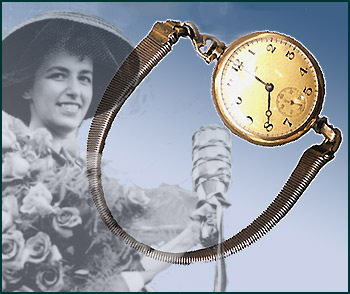 Though President Wilson saw fit to recognize the seamanship that this rescue must have entailed and that this gold presentation time-piece honors, the headlines that week were shrieking of the loss, in the same hurricane, of the liner Voltuna. With the sensational sinking of Titanic still resonating only 18 months previous, the Voltuna caught fire, was prevented from safely lowering her boats in the large seas generated by the storm, and ultimately sank with great loss of life, despite ten other vessels standing-by. The hands of Fate had more in store for the John Twohy, however. Despite being stranded and abandoned off North Carolina's Frying Pan Shoals, she was picked up minus her deckload of lumber by a Revenue cutter, only to be grounded again on the Cape Fear bar approaching Southport, refloated, beached, repaired enough to be sold with remaining cargo, and towed for rehabilitation to Philadelphia. 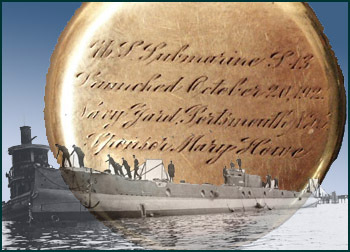 She suffered the final ignominy of being sunk by a U-boat off the Azores in July of 1917, no casualties. 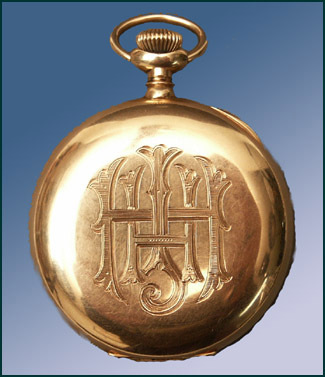 History would know nothing of Miss Mary Howe, except that she was accorded the singular honor of becoming the launching sponsor of a naval vessel, and was presented with an engraved wristwatch commemorating the event. On an October day in 1921, she broke a be-ribboned bottle against the prow of the submarine S-13 and watched it slide down the ways into the Piscataqua River at the Navy Yard in Kittery. She must have had quite an arm, for there is a sizeable prow-shaped dent in the silver case that fitted around the bottle, also in our collection; being Prohibition, it likely contained only grape juice. IBM equipment has long shed its oak cabinetry, but this ca. 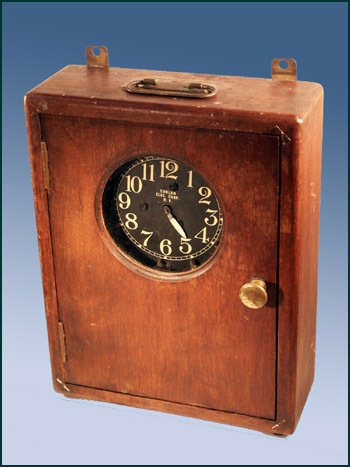 1925 International Business Machine "Daily Dial Attendance Recorder" was thus elegantly ensconced. 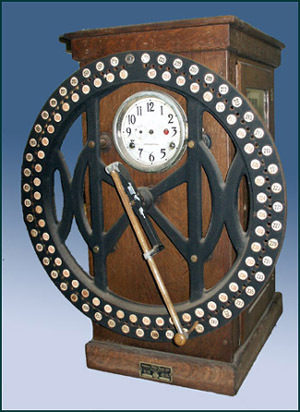 A pendulum driven clock is linked to a mechanism that presses the individual employee's number onto the internal paper-wrapped drum when the arm on the front dial is swiveled to that number and pushed in. A second number recorded departures. It was used at the Hyde Windlass Co., here in Bath. 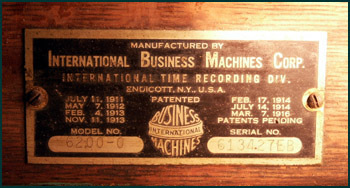 The International Time Recording Co., one of IBM's founding divisions when it incorporated in 1911 as C-T-R, the Computing, Tabulating, and Recording Co., evolved from the consolidation of several 1890's time recording companies and their patents.